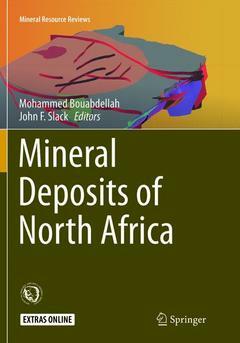 Coordinators: Bouabdellah Mohammed, Slack John F.
This volume presents an exhaustive overview of major orebodies and mineral deposits of North Africa. It is intended both for academic researchers and especially for exploration geologists interested in mineral exploration in the northern part of the African continent. Recent changes in the mining laws of most countries in this region have encouraged international mining companies to invest in local mineral industries. Accordingly, this volume will be very useful for these professionals, as well as for researchers in the field of economic geology. Degassing as the Main Ore-forming Process at the Giant Imiter Ag-Hg Vein Deposit in the Anti-Atlas System, Morocco.- The Polymetallic (W-Au and Pb-Zn-Ag) Tighza District (Central Morocco): Ages of Magmatic and Hydrothermal Events.- The Bou Madine Polymetallic Ore Deposit, Eastern Anti-Atlas, Morocco: Evolution from Massive Fe-As-Sn to Epithermal Au-Ag-Pb-Zn ± Cu Mineralization in a Neoproterozoic Resurgent Caldera Environment.- U/Pb Ages of Magmatism in the Zgounder Epithermal Ag-Hg Deposit, Sirwa Window, Anti-Atlas, Morocco.